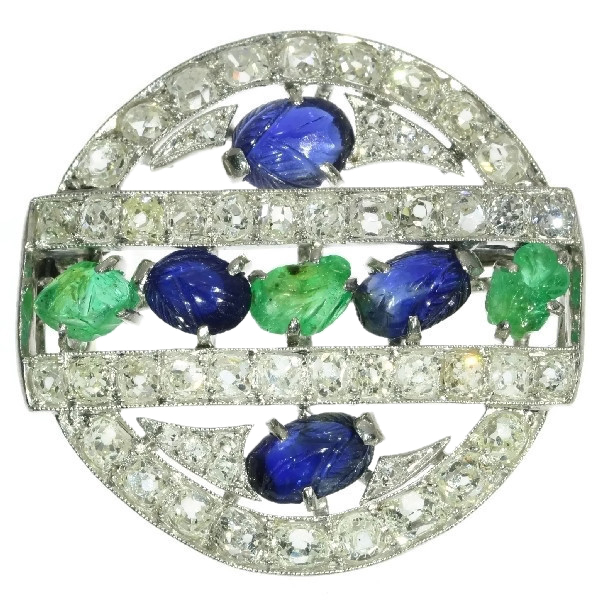 French Art Deco so-called tutti frutti brooch with diamond emerald sapphire: Description by Adin Antique Jewelry. Extra information: Tutti Frutti - Jewelry like this, set with brightly colored gemstones polished as leaves are called "Tutti Frutti jewelry". The first Tutti Frutti piece was a necklace commissioned by Queen Alexandra and designed by Pierre Cartier in 1901. Tutti Frutti jewel designs are considered to be a perfect mix of East and West because they are made up of brightly colored gemstones (like sapphires, rubies and emeralds) carved using Indian techniques and set in French platinum and diamond mountings.The style became extremely popular during the 1920's, but it wasn't named 'Tutti Frutti' until 1970. Diamonds: 42 old brilliant cut diamonds with a total estimated weight of approx. 2.94 crt. (approximate color and clarity G/J, vs/si) and ten smaller old brilliant cut diamonds with a total estimated weight of approx. 0.15 crt. Total diamond weight: approx. 3.09 crt. Precious stones: Four sapphires and three emeralds, all polished and engraved as leaves. Birthstones: Diamond is the birthstone (or month stone) for April, sapphire for September and emerald for May. Makers mark: The makers hallmark is eligible although we think we recognize the letter C as part of this hallmark. Hallmarks: The French control marks representing an eagle’s head (that was in use in France from about 1838) next to the dog's head which is the official French hallmark for jewelry containing or made of platinum and that has been used since 1912..